This is a nail-biting adventure about hidden gems of history, including Emory Conrad Malick, black and women’s aviation history, and the history of Camden and the Victor Talking Machine Company, suitable for ages 8-13 (and beyond). "Aunt Cora’s Wart" is available on Amazon.com in both paperback and Kindle. All of Mary’s children’s books are now available in both paperback and Kindle on Amazon.com. November 14, 2017: Mary will be speaking about E. C. Malick for the African American Genealogy Group (AAGG.org) beginning at 6:30 P.M. at Pinn Memorial Baptist Church, 2251 North 54th Street, Philadelphia, PA 19131. Parking available. September 21, 2017: Mary presented a program about E. C. Malick for the Pennsauken Historical Society in the Community Room of the Pennsauken Free Public Library, 5605 Crescent Blvd., Pennsauken, NJ 08110. March 26, 2017: Mary Groce will be presenting a program about Mr. Malick at the Camden County Historical Society, 1900 Park Blvd., Camden, NJ 08103 (cchsnj.org). The program begins at 1:00. October 17, 2015: Mary will be speaking about her research on Emory Conrad Malick during the Homecoming Genealogy Conference at Neumann University. October 3, 2015: Mary will be sharing information about E. C. Malick at the 6th Annual History-Mystery Event at the Lazaretto (www.1799Lazaretto.com). February 21, 2015: Mary will once again be a guest speaker for the Fifth Annual Celebration of Black Aviation at the American Airlines C.R. Smith Museum auditorium, Fort Worth, Texas, beginning at 2:00 P.M. (crsmithmuseum.org). 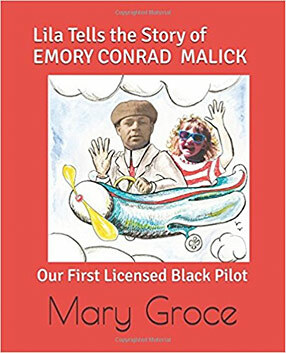 June 21, 2014: Please join Mary at her E. C. Malick exhibit during the Juneteenth Festival between 10 and 4 on the 6300 block of Germantown Avenue, Philadelphia, Pa.
February 19, 2014: Mary Groce will be presenting “Emory Conrad Malick: Local Hero and First Licensed Black Pilot” at the Woodbury Public Library in Woodbury, NJ, at 7:00 P.M.
October 19, 2013: Mary Groce spoke about the discovery of her great Uncle Emory as part of a panel discussion on genealogy (“Uniquely You: Your Family’s Place in History”) at Neumann University. October 5 and 6, 2013: Mary Groce will be speaking and presenting information about Emory Conrad Malick as part of the Fourth Annual History and Mystery Weekend at the 1799 Lazaretto (www.1799lazaretto.org). August 24 and 25, 2013: Emory Conrad Malick will be honored as a Pennsylvania pioneer of flight, and as the first African American to receive a pilot’s license in the U.S., during the Lehigh Valley Air Show (www.lehighvalleyairshow.com). June 20, 2013: Beginning at 7:00 P.M., Mary will be presenting a program about Emory C. Malick for the Northumberland County Historical Society (www.northumberlandcountyhistoricalsociety.org), Sunbury, Pa. (Emory’s hometown!). June 17, 2013: Mary Groce presented a talk on Emory Conrad Malick after an eloquent lecture by Dr. Eugene Richardson about the Tuskegee Airmen for the courteous students at the Edward W. Bok Technical High School in Philadelphia. The school has now been closed due to funding cuts. June 15, 2013: Mary will be presenting information about Emory Conrad Malick from 11 a.m. to 2:00 p.m. at the Fourth Annual Juneteenth Celebration in Woodbury, New Jersey (www.greaterwoodburyartscouncil.org). Wednesday, April 3, 2013: Mary Groce will be presenting a Power Point lecture about Emory Conrad Malick for the Northeast Philadelphia History Network (nephillyhistory.com) at the Pennepack Baptist Church, 8732 Krewstown Road, Philadelphia, PA 19115, beginning at 7:00 P.M.
March 22, 2013: Mary Groce gave two short lectures about Emory Conrad Malick as part of a program about Black Aviation presented by the Greater Philadelphia Chapter of the Tuskegee Airmen for the courteous, enthusiastic students of the Philadelphia High School for Girls. February 23, 2013: Emory Conrad Malick will again be featured (and I will be speaking) in the Third Annual Celebration of 100 Years of Black Aviation at the C.R. Smith American Airlines Museum in Fort Worth, Texas (www.crsmithmuseum.org). 2012: Renowned artist, Stan Stokes, completed a portrait of Emory Conrad Malick in flight in a 1912 Curtiss Pusher (see Photo Archive). What a perfect way to honor the Centennial of Uncle Emory’s International Pilot’s License! November 30, 2012: Mary Groce presented several short PowerPoint lectures about Emory Conrad Malick to students of the McDaniel School in Philadelphia, Pa., as part of a program presented by the Greater Philadelphia Chapter of the Tuskegee Airmen. September 24, 2012: Mary Groce will be presenting a program about Emory C. Malick for the Historic Langhorne Association (www.historiclanghorne.org) on Monday, September 24, 2012, at 7:30 P.M.
June 16, 2012: Mary Groce will be displaying information about Emory C. Malick from 11:00 a.m. to 2:00 p.m. at the Third Annual Juneteenth Celebration in Woodbury, New Jersey (www.greaterwoodburyartscouncil.org). May 23, 2012: Mary presented a series of programs about E. C. Malick to the very attentive and very cool students of Grace Wilday Junior High School in Roselle, New Jersey. Please check out their history class website, www.historytrackers.webs.com. April 5, 2012: Mary Groce will be presenting a program at 7:00 P.M. for the Historical Society of Bensalem Township (www.bensalemhistoricalsociety.com) about Emory Conrad Malick and his connection with Ernie Buehl and the Flying Dutchman Air Service. March 20, 2012: The Centennial of Emory Conrad Malick’s FAI Pilot’s License will be celebrated in my program (6 P.M.) at the San Diego History Center, Balboa Park, San Diego, California. Uncle Emory earned his license on this day exactly one hundred years ago (March 20, 1912), on North Island, San Diego, while a student at The Curtiss Aviation School, thereby becoming the first licensed African American pilot, and very possibly the first licensed black pilot in the world. February 4, 2012: Emory Conrad Malick will again be featured (and I will be speaking) in the Second Annual Celebration of Blacks in Aviation at the C.R. Smith American Airlines Museum, Fort Worth, Texas (www.crsmithmuseum.org). December 29, 2011: Emory will be featured in the African American Registry (www.aaregistry.org). Emory’s birthday was December 29, 1881. He would have been 130 years old on this day. December 10, 2011: Emory is featured (twice!) in a video honoring Dr. Guy Bluford, the first African American astronaut, at the Pennsylvania Society’s Holiday Gala at the Waldorf-Astoria, New York City. Wings Field, Blue Bell, Pa.
October 6, 2011: Program for the Genealogical Society of Centre County, in State College, Pa.
February 20, 2011: Mary Groce presented a program about Emory Conrad Malick for the congregation of Faith Tabernacle Baptist Church, Philadelphia, Pa.
February 17, 2011: Ms. Groce spoke about E. C. Malick as part of the dedication of the Greater Philadelphia Chapter of the Tuskegee Airmen Collection to the archives of the Charles L. Blockson Afro-American Collection at Temple University, Philadelphia, Pa.
January 29, 2011: Mary Groce was a featured speaker at the First Annual Celebration of 100 Years of Black Aviation at the C.R. Smith American Airlines Museum in Fort Worth, Texas (crsmithmuseum.org). January 16, 2011: Ms. Groce presented a program about E. C. Malick for the Association for the Study of African American Life and History (ASALH.org) at the Free Library of Philadelphia.